After the Oregon State men’s basketball team’s 85-70 win over No. 21 USC on Jan. 24, Tres Tinkle began to make plans for the rest of his evening. Fresh off an 18-point, seven-rebound performance, the freshman forward wasn’t thinking about a big party. 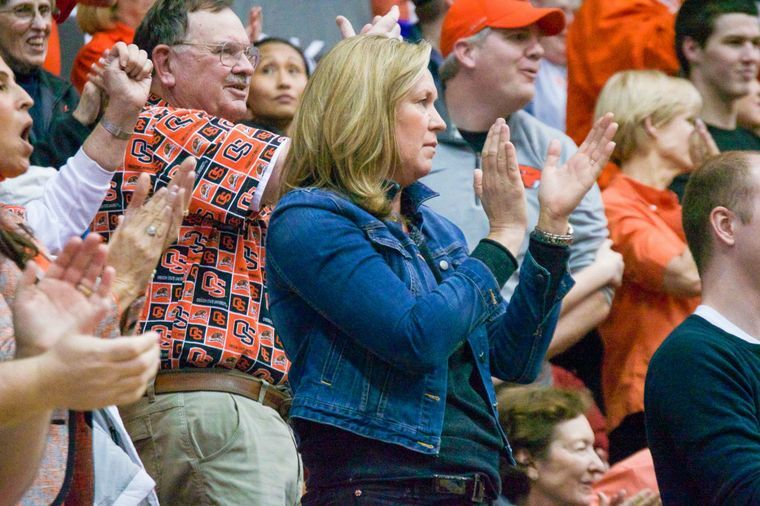 Instead, he ambled over to his mother Lisa an hour after the game ended with Gill Coliseum nearly empty. Tres, a four-star recruit turned-starting forward for OSU, chose to play college basketball for his father, Wayne Tinkle. Wayne had never coached Tres at any level of basketball, so the experience was unique for both when preseason practices began. What isn’t new is the close bond between Tres and Lisa that has strengthened even further now that both still live in the same town. It was Tres and Lisa, after all, who lived together during Tres’ senior season of high school basketball in Missoula, Mont., while Wayne was busy building a program in Corvallis. With Tres’ older sisters off to college and beyond, it was just mother and son. Since the Tinkles were trying to sell the house, there was almost no furniture at all; Tres slept on an air mattress in the same room as Lisa whenever she was in town. “It was good having her with me and showing her support and love for me,” Tres added. Both Tres and Lisa valued their time together in Missoula, but it wasn’t as if they weren’t close already. Though Wayne never coached Tres until college, Tres’ third grade YMCA team coached by Lisa won the league championship. Lisa was home more often throughout Tres’ childhood, and Tres could tell she would be the more emotional parent of the two if he chose to attend college far away. “I wouldn’t trade those years for anything,” added Lisa of living with Tres through his senior year. Tres, who is not ashamed to call himself “a momma’s boy,” is still able to enjoy the fruits of being a son while at OSU. While most of his teammates at OSU don’t have the privilege of seeing their family often, Tres doesn’t take for granted how close his parents still are: even during the season he would drop by his parents’ house for dinner as much as twice a week. His mom understands he’ll still often choose to spend time with teammates at friends away from home, Lisa is still completely capable to spoil Tres: since she still has a copy of Tres’ car key, she surprises him by leaving some desserts in his car on the occasional weekday morning. Wayne may or may not have qualms about the sugary treats, but he knows how close Lisa and Tres are and his coaching commitments have made him see the value of family time. As much as Tres and Lisa are able to connect in non-basketball ways, Lisa can hold her own when it comes to the hardwood. Her YMCA coaching championship was no fluke: the 6-foot-2 forward was inducted into the Montana Sports Hall of Fame in 2011. She scored 1,470 points and grabbed 830 rebounds while playing at Montana. As much basketball success and experience as Lisa has, though, she lets Wayne do most of the coaching. Growing up, Tres and his sisters had a running joke: if their father said after a game they could have played better, it was normal. But if their mother thought they played poorly, that’s when they knew they had really messed up. “You know you played bad when mom — who normally is kindhearted and nice — would let you know,” Tres said. While Wayne and Tres built a new coach-player connection this year, Lisa has found a new role in the trio in addition to being a mother. With Tres experiencing Wayne’s hard-nosed coaching for the first time, it wasn’t easy for Tres to adapt to the new side of the relationship. Lisa quickly became a “sounding board” for Tres when he needed to speak his mind. Things have certainly gotten easier for Tres, who earned a starting spot five games into the conference schedule and is averaged 13.1 points and 5.4 rebounds per game this year, both good for second on the team. Highlighted by a career-high 23 points and 11 rebounds versus Quinnipiac along with a 19-point outburst against Oregon the very next game, Tres’ growth comes as no surprise for Lisa. The feeling is mutual between all members of the Tinkle family. Lisa has traveled to wherever her two daughters are, whether it’s a trip to Spokane, Wash., to visit Elle, a senior on Gonzaga’s women’s basketball team, or a long flight to see Joslyn, a professional basketball player in Australia.